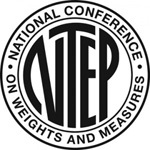 The EQM model is available on 400, 800 or 2000lbs. capacities. It can also toggle between kilograms and pounds with its precise readout to deliver the versatility and pinpoint accuracy you need to ensure that your shipments disperse and arrive at the expected weight. The EQM Series Shipping and Receiving Scales are an ideal tool for storage companies, markets, shipping departments, suppliers, foundries, manufacturers and more! The EQM-1000/2000 is equipped with a handlebar and (4) wheels to allow for easy movement and operation in your facility. Built to last, our scale features an AC adapter and built-in rechargeable battery with an auto power-off function to save power. 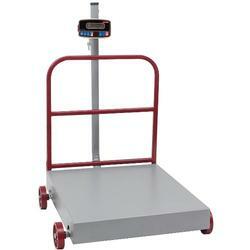 The large steel base is designed to handle the rough handling of every day industrial weighing. The EQM-1000/2000 has a capacity of 2000 lbs x .5 lbs – this gives the scale the precision you need to help maximize your profits. A weighing area of 44" x 29" provides ample space to meet your weighing needs. The EQM-200/400 is equipped with a handlebar and (4) wheels to allow for easy movement and operation in your facility. Built to last, our scale features an AC adapter and built-in rechargeable battery with an auto power-off function to save power. The large steel base is designed to handle the rough handling of every day industrial weighing. The EQM-200/400 has a capacity of 400 lbs x .1 lbs – this gives the scale the precision you need to help maximize your profits. A weighing area of 32" x 27" provides ample space to meet your weighing needs. The EQM Series also features an easy to read display mounted on a 45.8" steel pillar, the the added flexibility to work as a remote indicator when using the scale as a platform. Tough enough for every day professional use, the EQM series also features overload and impact protection with a shock-absorbing platform and heavy duty steel construction. The EQM-400/800 is equipped with a handlebar and (4) wheels to allow for easy movement and operation in your facility. Built to last, our scale features an AC adapter and built-in rechargeable battery with an auto power-off function to save power. The large steel base is designed to handle the rough handling of every day industrial weighing. The EQM-400/800 has a capacity of 800 lbs x .2 lbs – this gives the scale the precision you need to help maximize your profits. A weighing area of 32" x 27" provides ample space to meet your weighing needs.